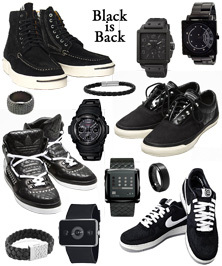 Black accessories are the easiest wardrobe match-ups of all. 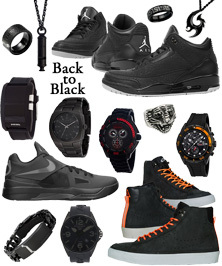 Here are some of the latest releases: sneakers and watches – some jewelry suggestions and a whistle. Click here to see the extra large pictures. It was a pleasure to find so many new ideas for truly masculine jewelry for men. In the past, men have had to select from rings, bracelets, and necklaces that were simply larger versions of female accessories. How cool it is to be able to wear a tire-tread, chain links, tiger head, eagle, skull or even something as simple as a thick black band on your finger or an IP black arrowhead, lion crest or a whistle on a black necklace! Tribal Hollywood, KingIce, and Titanium Jewelry are a couple good sites to begin your search.